In our Circonus Labs public github repo, we have started a project called Circonus Instrumentation Packs, or CIP. This is a series of libraries to make it even easier to submit telemetry data from your application. Currently there are CIP directories for go, java, and node.js. Each separate language directory has useful resources to help instrument applications written in that language. Some languages have a strong leaning toward frameworks, while others are about patterns, and still others are about tooling. These packs are intended to “meld in” with the common way of doing things in each language, so that developer comfort is high and integration time and effort are minimal. 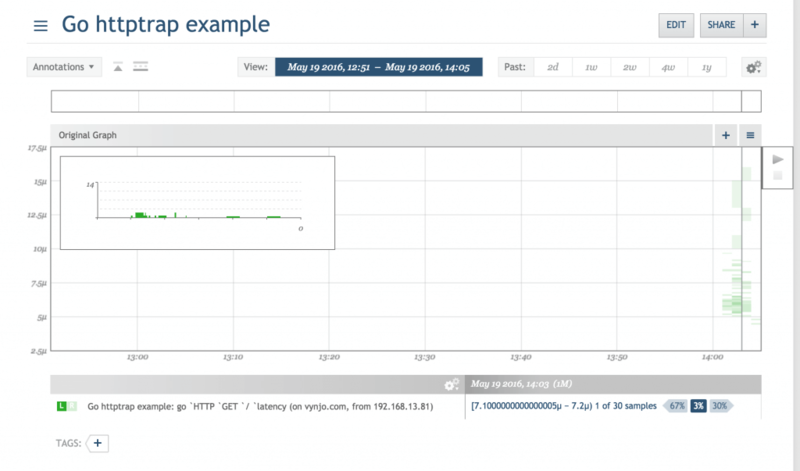 Each of these examples utilize the HTTP Trap check, which you can create within Circonus. 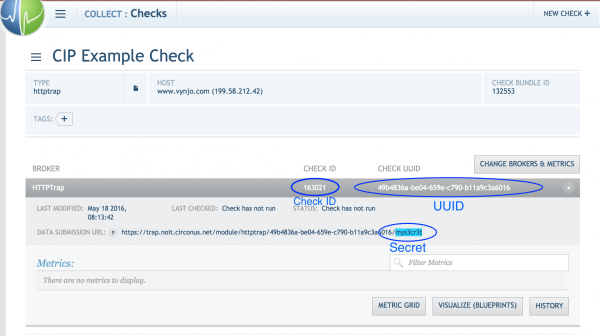 Simply create a new JSON push (HTTPTrap) check in Circonus using the HTTPTRAP broker, and then the CheckID, UUID and secret will be available on the check details page. This can be done via the user interface or via the API. The “target” for the check does not need to be an actual hostname or IP address; the name of your service might be a good substitute. 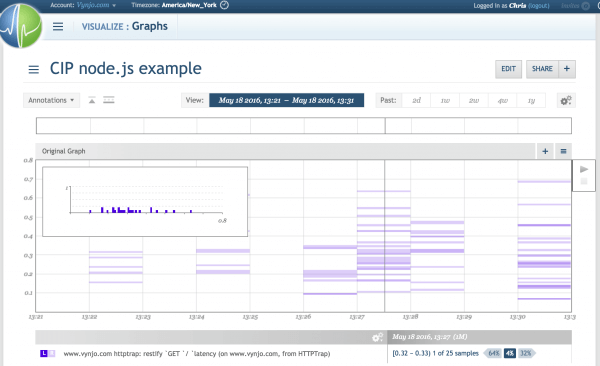 We suggest that you use a different trap for different node.js apps, as well as for production, staging, and testing. Java has a very popular instrumentation library called “metrics,” originally written by Coda Hale and later adopted by Dropwizard. Metrics has some great ideas that we support whole-heartedly; in particular, the use of histograms for more insightful reporting. Unfortunately, the way these measurements are captured and reported makes calculating service level agreements and other such analytics impossible. Furthermore, the implementations of the underlying histograms (Reservoirs in metrics-terminology) are opaque to the reporting tools. The Circonus metrics support in this CIP is designed to layer (non-disruptively) on top of the Dropwizard metrics packages. This library supports named counters, gauges, and histograms. It also provides convenience wrappers for registering latency instrumented functions with Go’s built-in http server. Initializing only requires you set the AuthToken (which you generate in your API Tokens page) and CheckId, and then “Start” the metrics reporter. This instrumentation pack is designed to allow node.js applications to easily report telemetry data to Circonus using the UUID and Secret (instead of an API Token and CheckID). It has special support for providing sample-free (100% sampling) collection of service latencies for submission, visualization, and alerting to Circonus. Then go to your browser and load localhost:8888, or at the prompt curl http:localhost:8888.